I have spent my entire life by the sea, and have always loved being on the water and fishing the beautiful seas around my home, from my first bamboo rod to now with my own boat. I am now in my 30 with almost 12 years fishing experience, and over the years I have come to know every inch of the sea around me, but have never lost my love and respect for the sea and the amazing creatures which live in it. Fishing is my passion, and I am fortunate to make this hobby my profession. I feel blessed to work doing the thing that that I love. Every day I have new challenges, learn new tricks and get to meet lovely, happy customers who become friends. During the summer I love trolling and live bait fishing for Tuna. This type of fishing lands average catches of 50 kilos and some giants weigh up to 300! Luckily in Marbella we are able to enjoy all kinds of fishing thanks to the rich bounty of the waters so close to Puerto Banus. And this makes sure we always catch Snapper, Bream, Dace, Sunfish, Scorpion Fish, Conger Eels and so many more. For bottom fishing, either natural bait, live bait or trolling, my favorite catch is Sea Bream. A very clever, combative and strong fish that makes for a great fight. Amazing fishing trip - tuna, mackerel, sea bass and more! 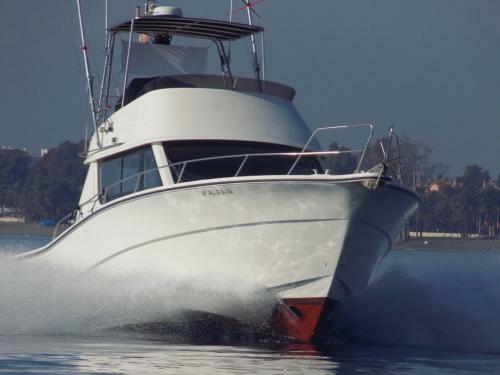 Very great ship, super friendly Captain and assistant, plenty of space to fish as well as to relax. Definitely will be back! Hi Timo ! Thank you ! We also hope see you soon! Great day. We were very well looked after. Highly recommended. Thank you Tri! Was fantastic to meet people like you! Hope see you soon ! !